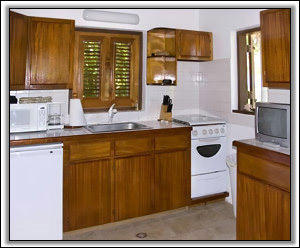 Conch Shell Cottage - Nevis Island Luxury Villa Rentals - 1 Bedroom Located On Nisbet Beach. 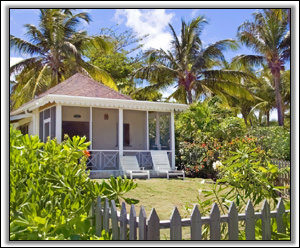 Conch Shell Cottage - Nevis Island, West Indies. Perfect for a honeymoon, romantic holiday, or a one person retreat. 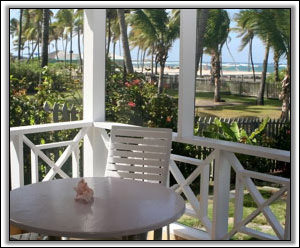 Conch Shell Cottage is located on the secluded Nisbet Beach, with the privacy of a picket fence draped in flowering bushes and palms and acres of beach, yet without being too isolated since the small 4 star Nisbet Plantation Resort and its bar and restaurants is beach foot steps away. 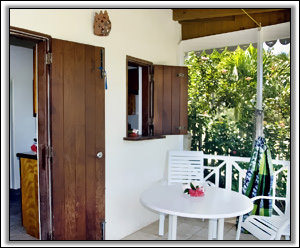 The interior, in Caribbean style vaulted ceiling, is bright, inviting and charming with original art by local artists, is immaculately clean and very well maintained. The screened-in porch has a table, chairs, hammock while the patio has comfortable chaise lounge chairs for sunning, relaxing and reading. You can see the beach and hear the waves curling over the pristine reefs and enjoy the magnificent clear evening sky with moonlight and incredibly bright stars. You will be met at the airport or ferry and brought to the cottage. A caretaker will be available. Conch Shell has Wi-Fi, Cable TV, local phone service, and a gas BBQ. Why we have so many repeat guests: Conch Shell Cottage is in the best location on Nevis, on a beautiful white coral sand beach near pristine coral reefs and privately hidden by palms and tropical flowering bushes, yet close to a small upscale resort and its bar and restaurants. Guests mention how incredible the staff is and how welcome they feel. Marlon, tall and smiling, will greet you at the airport or wherever your boat lands on Nevis. He will transport you to the cottage and happily answer your questions on the way. Then Bonnie, the caretaker, will greet you, give you an orientation to the cottage and island, and be available if you have any questions during your stay. She will purchase a few groceries for you before your arrival. Carmen, the maid, has carefully cleaned the cottage for you. Henry, the gardener, has created a beautiful garden for you and will try to give you fresh fruit that he has grown. Pre arrival, I will send you info on special car rental, restaurants, things to see and do, airline info, etc. 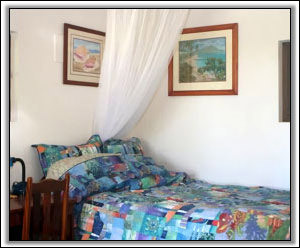 How our repeat guests found Conch Shell Cottage: Until recently we only advertised our luxury 1 or 2 bedroom Coral Reef Villa which is privately located on almost an acre of spectacular mature gardens nearby. 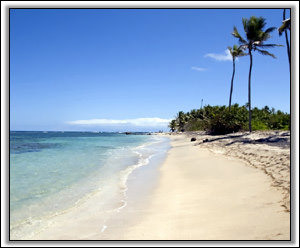 It is so popular that guests who wanted extra days stayed also at Conch Shell and often wanted to return to both places. 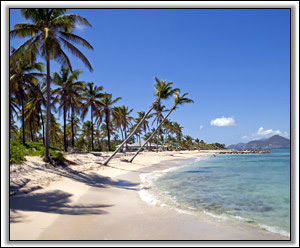 Others discovered Coral Reef / Conch Shell when they had stayed at resorts or other villas on Nevis, and after exploring, decided the Nisbet Beach location was the most beautiful, convenient (with the small resort beach side facilities), secluded enough and yet without being too isolated. 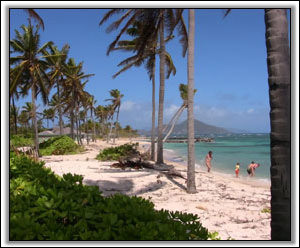 Other guests had been on other islands and when they visited Nevis decided that the Nisbet area was where they wanted to stay. Nevisians are known for their friendly smiles and welcome to visitors. Nevis is special with only about 10,000 people, no high rise buildings (nothing taller than a palm tree allowed), no large cruise ships, no gambling.